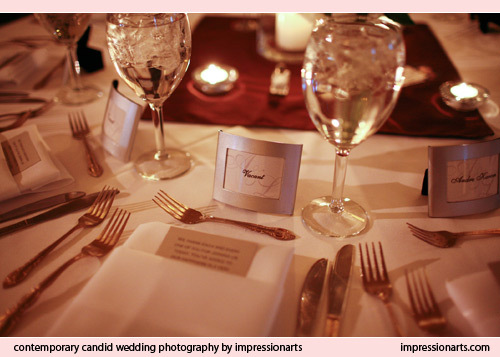 At this wedding, each guest had his own framed place card, which could be taken as a memento of the evening or used later for a photo frame. Simple touches such as an elegant place setting, and a menu tucked into a napkin, greet the guest and establish anticipation for the celebratory meal to come. Photo courtesy Impression Arts/Studio 98.